Built in several stages during the XVI century, Masseria San Lorenzo extends over a park area with centuries-old olive groves and palm trees of approximately 3 hectares. The covered area of approximately 1.000 square meters includes a reception hall that can accommodate 300 people. The very comfortable close room is a great venue for smaller events up to 50/60 people. The external areas capacity is of about 800 people. The venue has two entrances, parking areas, a very old crypt/cistern (used first as a crypt and as a place of worship and then as a cistern), a vast fortified courtyard (the pivot of the daily country life), an ancient and perfectly preserved farmyard (where wheat and other cereals were processed with the help of a donkey or mule), a botanical garden obtained from a recovered ancient quarry (from which the stones used to build the Masseria were quarried) featuring paths among rocks and streams, two woods (a big and a small one), orange groves, paths, terraces and pergolas where you can spend your daily hours. 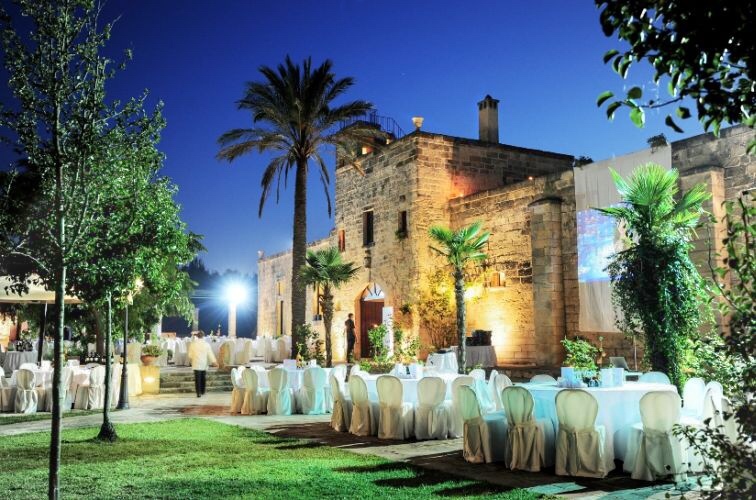 A stone's throw from Lecce, in a green oasis, Masseria San Lorenzo is your exclusive location for weddings, conferences, baptisms, confirmations and communions. To guarantee the highest culinary experience, we engage the best catering services. The phone number of Masseria San Lorenzo is +39 3333336045.